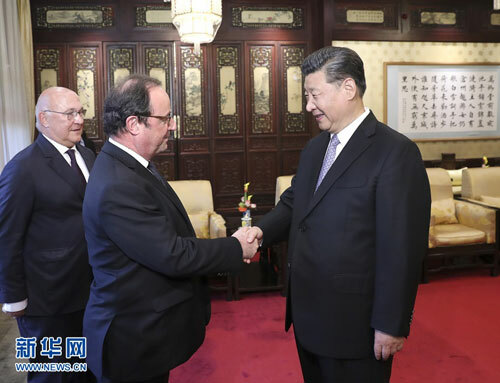 On May 25, 2018, President Xi Jinping met with former President Francois Hollande of France at the Diaoyutai State Guesthouse. Appreciating the contributions made by Francois Hollande during his tenure as President of France to promoting China-France relations and enhancing China-France cooperation in international affairs, Xi Jinping pointed out that we successfully achieved mutual visits and jointly opened up a close and enduring China-France comprehensive strategic partnership during your tenure, laying a sound foundation for the long-term development of bilateral relations. President Emmanuel Macron paid his first state visit to China in January this year, and both countries reached broad consensus on expanding cooperation in bilateral and multilateral areas. I have full confidence in the prospects of China-France relations. Xi Jinping pointed out that the international situation is undergoing profound and complicated changes at present, and all countries in the world are becoming more interdependent to each other at the same time and no country can stand aloof. China is willing to work with France to enhance strategic coordination, stick to the process of multilateralism, jointly address global challenges, and promote world economic growth as well as trade and investment liberalization and facilitation, so as to make positive contributions to safeguarding an international order that is peaceful, stable, open and inclusive. China also stands ready to devote itself to enhancing cooperation with the European Union. Francois Hollande said he was very glad that he had made efforts to enhance France-China relations and injected fresh impetus into bilateral comprehensive strategic partnership during his tenure as President of France. He cherished the friendship with President Xi Jinping, and spoke highly of China’s positive role in international affairs under the leadership of President Xi Jinping, especially China’s important contributions to the realization of the Paris Agreement on climate change. Under the current situation, he was very happy to see the momentum of strategic cooperation between France and China can continue and be consolidated, as this is conducive to safeguarding multilateralism and resolving international and regional issues via dialogue and cooperation.